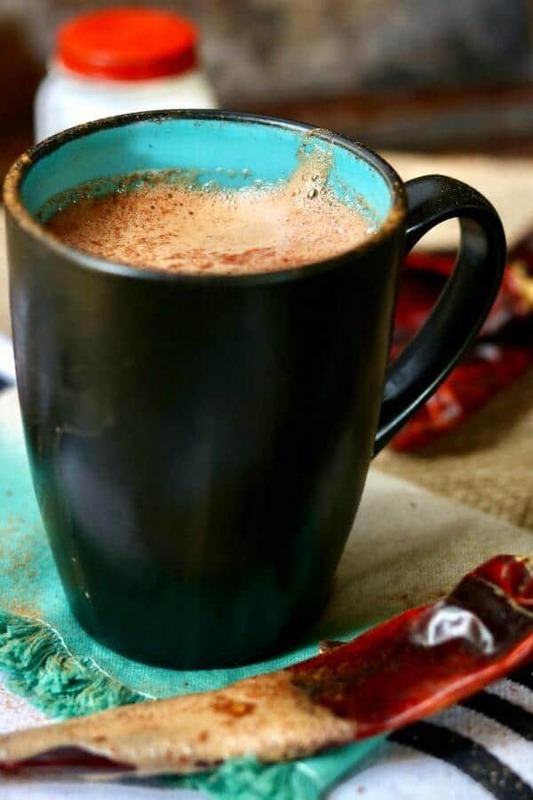 Spiked Mexican Hot Chocolate is the adult version of your favorite childhood apres sledding traditions. 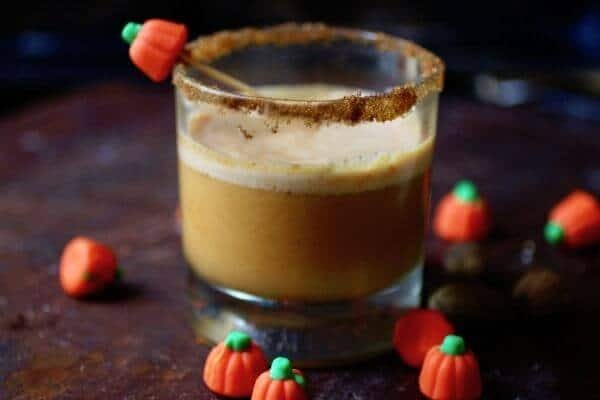 Milk and cream are scalded, infused with guijillo chile and Mexican chocolate, spiked with coconut vodka and rum, then frothed until a foamy layer appears on the top. Put another mesquite log on the fire, make a couple of these, and hit the Netflix button — it’s time to cocoon. This is day 4 of #Choctoberfest! I am not totally fond of cold weather. In fact, it is a chilly 55 degrees outside at the moment and I am huddled in my chair wrapped in a blanket. All y’all that live up there in the frozen tundra above the Mason Dixon? One thing I DO like, in fact love, about cold weather (anything under 70 degrees thank-you-very-much) is that I can have a crackling fire going here in the kitchen and sip hot chocolate. It’s totally safe to have a fire in my kitchen, by the way. We live in a house that’s over 100 years old and there really is a fireplace in my kitchen – pinkie swear. 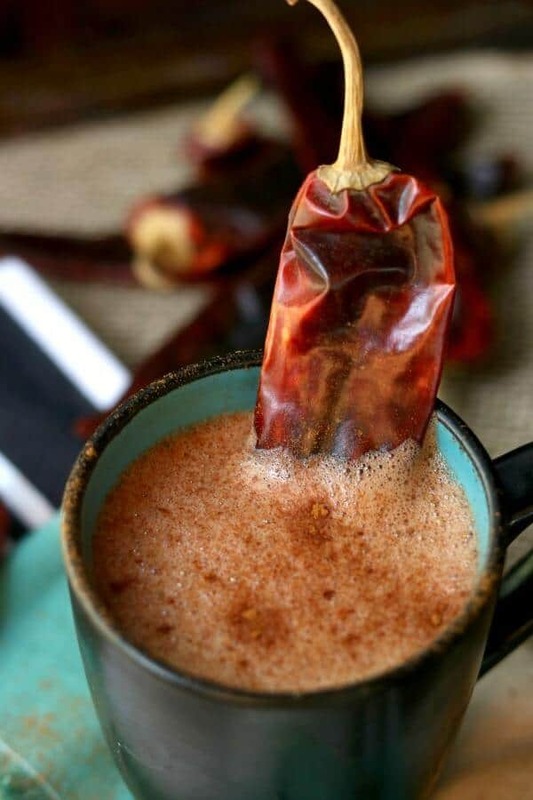 And, if it’s late afternoon or a weekend then this Spiked Mexican Hot Chocolate is likely going to be cupped in my frigid fingers. Mexican chocolate is chocolate mixed with sugar and spices that comes in 3.3 ounce rounds. Each round is divided into wedges. Because of the sugar and spices the chocolate is gritty rather than creamy but melted in a cup of hot milk it’s heaven. We have it everywhere here but if you can’t find it check the Amazon link below. No worries – this won’t taste exactly the same but it’s pretty close. Mix 1.5 ounces bittersweet chocolate with 2 teaspoons of brown sugar, 1/4 teaspoon of cinnamon, and a pinch of nutmeg. This is good for moles and sauces. If you’re using it for hot chocolate make a smooth paste with the cocoa mixture and cream before adding it to the milk. Mexican chocolate is available in grocery stores here in Texas but you may need to find a Mexican or Latin American market where you are. OR you can do it the easy way and order from Amazon. Ibarra is my favorite brand but there are several. Frothing it up makes the texture just unbelievably yummy and once you have a frother you’ll be able to make all those yummy lattes and such. 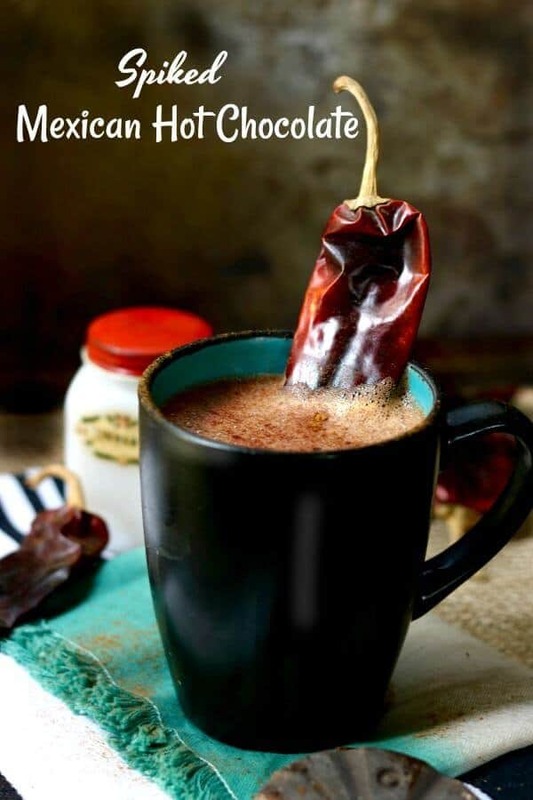 This spiked Mexican hot chocolate isn’t really a party recipe. It’s a hot sip of chocolaty goodness for those times when an icy rain is tap dancing against the fogged up windows, a fire is crackling in the fireplace, you’re wearing your favorite thick socks, and maybe sharing an afghan with either the dog or the spouse… or both. Like this recipe? Please consider giving it a star rating below. ? Follow me on Facebook and Pinterest! 1 ounce white rum, , spiced rum is nice too. Break up the chocolate and set aside. Heat the milk, cream, brown sugar, salt, and guijillo chile on the stove in a heavy saucepan until bubbles form around the edge. Stir in the chocolate and whisk until melted and the mixture is thoroughly blended. Remove the chile and discard. 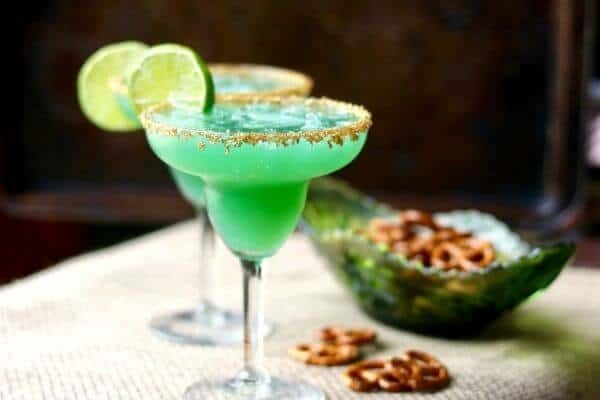 Pour the mixture into a cup and use a frother to create a thick, frothy foam on top. If you don’t have a frother just pulse the mixture in a blender for a few seconds. Pour into a warmed coffee mug and gently stir in the vodka and rum. Dust with cinnamon and add a whole guijillo chile as garnish. 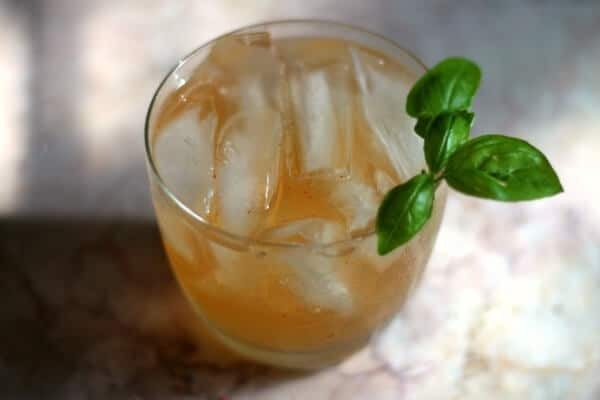 If you can’t find Mexican chocolate then use bittersweet chocolate and add a pinch of cinnamon, nutmeg, and a few drops of almond extract to your finished drink. You’ll probably need to adjust the sugar as well. Here’s More Great #Choctoberfest Recipes!! « Mexican Hot Chocolate Cupcakes: #Choctoberfest! oh yeah…..now that’s what I’m talking about! LOL you are like my husband who is from Alabama. Whenever we visit my family in PA during the winter, he is like “HO DO PEOPLE LIVE IN THIS FROZEN LAND?!? 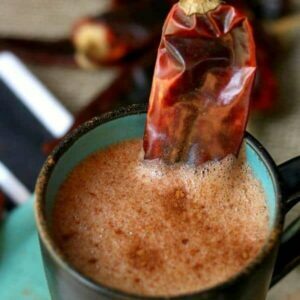 !” We live in Virginia now, but it certainly does get chilly here in Jan/Feb, so we’ll have to give your hot chocolate recipe a try once the temp dives!